Written By moumtzis on Τρίτη, 8 Μαΐου 2012 | 2:15 μ.μ. measurement not yet widely used in clinical practice. this month by the American Association of Clinical Endocrinologists. Association guidelines, similarly, call 70 mg/dL a "reasonable" goal for very high-risk patients. Dr. Paul S. Jellinger, lead author of the guidelines, said that aiming for an LDL below 70 mg/dL for all patients with CAD, or those with diabetes plus at least one additional risk factor, reflects both a mounting scientific consensus and current practice. For patients at high risk – including people with diabetes and those with two or more risk factors and a 10-year Framingham risk of coronary heart disease – the AACE recommends an LDL target of less than 100 mg/dl. Though the Food and Drug Administration recently changed statin labeling to reflect a slight hyperglycemia risk associated with their use, the new AACE guideline reinforces that patients with diabetes should be treated "aggressively." Dr. Jellinger of the Center for Diabetes and Endocrine Care in Hollywood, Fla., and professor of clinical medicine at the University of Miami also noted that, the guideline also recommends that clinicians check the apolipoprotein B levels of patients on LDL-lowering treatments. ApoB is a biomarker that indicates LDL particle number and, indirectly, particle size. "Measuring apoB is the easiest, cheapest, and most consistent way to tell us that we've reduced the total number of LDL particles. It is more difficult to lower apoB than to lower LDL." 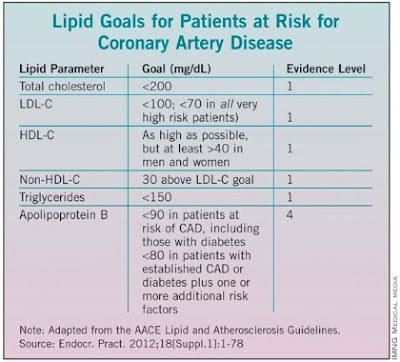 While non-HDL is also a key measurement, and should be included in all reports, Dr. Jellinger said, "We look at non-HDL as a very good way to start and apoB as a very good final measurement to ascertain that you have reached your pharmacotherapy goal." The AACE guidelines advise physicians to look at apoB even when LDL levels appear to be well controlled and at goal and consider apoB as a secondary therapeutic target. Recommended apoB levels for patients at risk of CAD, including those with diabetes, are less than 90 mg/dL, and less than 80 mg/dL for patients with established CAD or diabetes and one or more additional risk factors. The guidelines note the evidence here is not as strong as for the other recommendations. Measurements of homocysteine, uric acid, and plasminogen activator inhibitor-1 are not routinely recommended by the AACE for use in stratifying risk due to the uncertain evidence of benefit achieved by lowering these factors. But the AACE encourages looking at the inflammatory markers highly sensitive C-reactive protein (hsCRP) and in some patients lipoprotein-associated phospholipase A2 (Lp-PLA2), when risk is uncertain and additional information is needed to decide how aggressively to treat. The guidelines note that while hsCRP can be useful in stratifying patients with intermediate risk, this marker can be elevated by systemic inflammation and obesity. 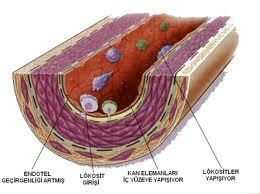 Lp-PLA2, an enzyme found in arterial plaque, is more specific for vascular sources of inflammation. "With both hsCRP and Lp-PLA2 elevated, it may be appropriate to be more aggressive with treatment in a patient otherwise considered at intermediate risk," Dr. Jellinger said. Also helpful in cases requiring precise risk stratification are two noninvasive measures of atherosclerosis: carotid intima media thickness and coronary artery calcification (CAC). But since there is no definite evidence that CAC, while strongly correlated with coronary atherosclerosis, independently predicts coronary events, the guidance warns that these are not helpful when performed routinely as a screening measure, which Dr. Jellinger said they often are. Rather, "they should only be used in certain situations as adjuncts to standard CVD risk factors to refine the patients' risk when considering more aggressive therapy," he said. The new guidelines recommend raising HDL-C levels as much as possible for patients at risk of CAD, but minimallyto greater than 40 mg/dL in both men and women. While statins remain the cornerstone of therapy, determining the roles fibrates and niacin should play in lowering triglycerides and raising HDL, and in which patients, is more complicated. Several scientific studies cited in the AACE guidelines support a clinical benefit for the use of fibrates in patients whose triglycerides are greater than 200 and whose HDL is less than 40 mg/dL or 35 mg/dL for primary and secondary prevention of cardiovascular events. There remains uncertain clinical benefit in patients treated with fibrates for lesser triglyceride and HDL abnormalities. Niacin is also recommended for increasing HDL and reducing LDL-C and triglycerides in certain patients despite results from AIM-HIGH, a randomized controlled trial that was terminated early after it became clear that patients whose LDL levels were very well controlled with simvastatin were seen not to benefit from the addition of niacin. Dr. Jellinger said that niacin may benefit patients with less well controlled LDL and that the AACE is awaiting the results of another, larger niacin trial (HPS2-THRIVE). "You probably don't have to start niacin if your LDL is very low. When your LDL is higher, we don't yet know. It may be suitable," he said. The guidelines also give more latitude as to when to order lipid testing. More frequent lipid testing may be indicated in the following circumstances: deterioration of diabetes control, the use of a new drug known to affect lipid levels, atherothrombotic disease progression, considerable weight gain, development of a new CAD risk factor and convincing new clinical trial evidence suggesting stricter lipid goals. The AACE's position "ought to give comfort to physicians who want to order more frequent lipid profiles under certain circumstances," Dr. Jellinger said.